Venil P. Johnson left this mortal existence on April 13, 2018 for a glorious reunion with his eternal sweetheart, parents and other loved ones and his Heavenly Parents. He was born January 22, 1922 in the home of his parents, Archie A. and Ora Perry Johnson in Vernal, Utah. He grew up working, playing, learning, loving and being loved in a wonderful family. He was taught the principles of the Gospel of Jesus Christ by both parents and loving teachers from an early age and remained true and faithful throughout his life. He served in many callings and positions in the Church of Jesus Christ of Latter Day Saints during his youth and as an adult including Bishop, Stake President and Counselor in the first presidency of the Vernal Utah Temple. 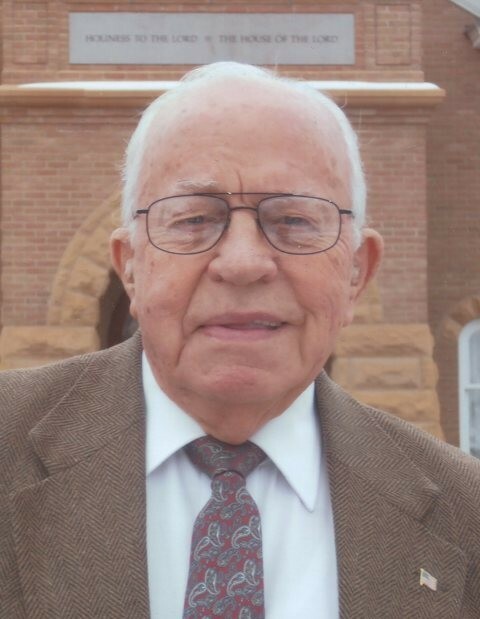 He attended Vernal schools and graduated from Uintah High School with the Class of 1940. He enrolled at Utah State Agricultural College that fall. When WWII opened with the attack on Pearl Harbor he immediately volunteered as a Naval Aviation Cadet. During the training process he was given the opportunity to transfer to the U.S. Marine Corps where he was commissioned as a Second Lieutenant upon earning his wings. As he began his training as a fighter pilot he met Gae Rose of Morgan County, Utah. Their courtship was almost completely through the US mail. They were married in the Salt Lake Temple Oct. 5, 1944. Following discharge from the military they returned to Vernal to start their family and life together. Their first son was born here and Venil received a job offer from the JC Penney store manager which began a life-long career in retail for him. They moved to Roosevelt to accept a position as assistant manager in the Penney’s store there. Three more sons were born to the couple there. Venil later accepted a job to manage the Christensen’s Dept. Store in Roosevelt. In 1962 the family moved back to Vernal where Venil opened a new Christensen’s store. He worked there until retirement in 1985. Upon being released as President of the Maeser Stake, Venil and Gae served a mission for the Church in the Chicago LDS Temple, then the Manila Philippines LDS Temple and lastly a genealogy mission in London, England over the next eight years. They were then called as ordinance workers in the Provo LDS Temple where they served until the Vernal LDS Temple was nearing completion where they were called as First Counselor and Assistant to the Matron respectively. Working together has always been a joy for both of them whether it was weeding the garden, gathering fire wood, canning peaches or whatever activity. But working together in the Temples was their greatest joy. They found complete fulfillment being together and serving in any of the Houses of the Lord. Working in the Temple has continued to occupy Venil’s life until just recently. Losing his eternal sweetheart, Gae, in 2010 has been his sorest trial. His daily motto has been, “The best is yet to come!” There is no doubt it has come! Venil was also preceded in death by his parents, brothers Eldred, Glendon and Doyle, sister- Lora and her husband Golden Bastian also brother in law Earl Parry . He is survived by his family – Perry and Sharon, Darwin and Marcie, Paul and Jacque and Erik and Lori and special Indian placement son Paul (Lori) Loman, numerous grandchildren and great grandchildren. Brother, Merlin (Sandy), sisters – Eula Rae (Lee) Walker and Myrna Parry, sisters-in-law Marva, Lela and Carol. Funeral services will be April 21, 2018 at the Rock Point Chapel (2575 N. 1500 W.) Viewings will be Friday 6 – 8 PM at Blackburn Vernal Mortuary and at the Chapel one hour prior to the services. Interment will be at the Maeser Fairview Cemetery with Military Honors provided by American Legion and The Patriot Guard Riders. Funeral Services will be provided by Blackburn & Sons Vernal Mortuary & Cremation Care.